The INBA-LLM India Fair 2017 aims at providing the perfect platform for scores of aspiring Indian law students on one hand, and globally reputed law schools and universities from USA, Europe, and Australia to meet and explore mutually and academically beneficial avenues of learning and growth. Law universities and schools will be able to demonstrate their sterling LLM syllabi and streams, illustrious faculty and highly acclaimed programs to a house full of law students who are desirous of seeking overseas admissions and getting their dreams fulfilled. Law schools and universities will directly benefit by the presence of scores of pre-qualified law students and their parents at the expo floor as also get heard and noticed at the seminar that would be organized on the sidelines of this fair. This fruitful India visit could also pave way for overseas law schools to engage into structured meetings with leading law colleges and schools in New Delhi & Bangalore. India prides itself as a leading technology, IT & ITES & Academic hub which attracts several thousand professionals to work and reside here. 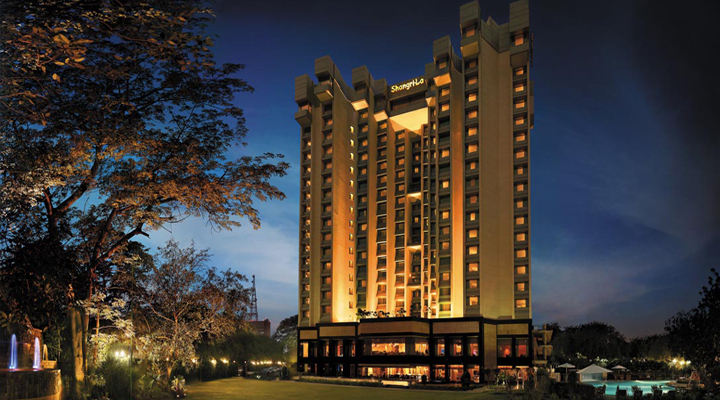 Ideally located in the city's centre, Shangri-La's - Eros Hotel, New Delhi, is within close proximity to government offices, shopping centres and commercial, financial and business districts. 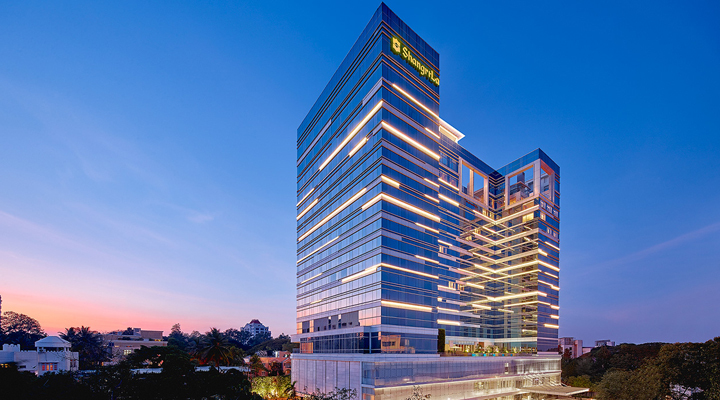 The hotel is a 30-minute drive from the domestic and international airports and a few minutes away from the international grounds of Pragati Maidan and most embassies. The hotel prides itself on showcasing a diverse range of food and beverage offerings in a luxurious atmosphere adjoining the lush green gardens. After a smooth landing at Kempegowda International Airport, where a Shangri-La representative warmly greets you and assists with your arrival, you are charmed by the vibrant and historical cityscape of Bengaluru. When you reach Shangri-La Hotel, Bengaluru, in the heart of India's Garden City, you marvel at the elegant double-height lobby and enjoy a refreshing cup of tea while live piano music plays in The Lobby Lounge. An experienced and welcoming member of the staff shows you to your room for a private check-in while you take in the panoramic city views. Looking out over the city from the comfort of your spacious room, you are thrilled by the discoveries that await you, from heritage architecture and art museums to beautiful parks and superb shopping on Brigade Road. Cardozo School of Law of Yeshiva University is located on lower Fifth Avenue in New York City's Greenwich Village. The law school offers approximately 1,100 J.D. and LL.M. candidates a comprehensive legal education in the midst of one of the world's leading cities for law, business, finance, media and culture. The University of Western Australia is a world Top 100 university. With more than 25,000 students, the University offers a comprehensive range of undergraduate and postgraduate degrees. The UWA Law School has 90 years' experience in producing high-achieving graduates, with alumni including judges, QCs and SCs, Rhodes and Fulbright Scholars, industry leaders and a former prime minister. At UWA, you'll be equipped with the skills and knowledge needed for a successful long-term career. Southampton University is a founding member of the prestigious Russell Group of Universities. It is in the top 1% of universities in the world (QS World University Rankings) and 16th in the United Kingdom (Guardian University Guide). Southampton Law School is ranked in the top 20 English Law School (QS World University Subject Rankings 2017/18). It is thus one of the leading law schools in the country with a worldwide reputation for excellence in teaching and research and is part of one of the foremost British universities. We have a strong network of links with business and industry and are home to some of the most prestigious research centres in the world including the Institute of Maritime Law and the Institute for Law and the Web (iLaws). Our LLM programme is one of the largest and most internationally diverse outside London. We regularly attract over a 100 masters students a year from a large range of countries in Europe, Asia and beyond. Indeed there is hardly a country in the world from which students have not at one time or another studied at Southampton Law School. This international profile is supported with established links with other leading law schools around the world. Our students thus not only receive a first class LLM experience but also join an international network of alumni. We offer a number of LLM programmes allowing students to tailor their study path to their own interests and career goals. In addition to our general LLM programme we offer distinct streams leading to an LLM in Maritime Law, an LLM Commercial and Corporate Law, an LLM in International Business Law, an LLM in Insurance Law, an LLM in Information technology and Commerce and an LLM in International Law. We also welcome research students wishing to study for an MPhil or PhD under the supervision of our subject experts. We pride ourselves on being a welcoming law school that cares for and supports our 600 undergraduate and postgraduate students. As well as excellent facilities our students have the benefit of outstanding teaching from our dedicated and enthusiastic staff who bring years of experience both as lawyers and teachers. Students are also supported with extracurricular activities that bring them into contact with the legal profession both locally and from London. Southampton is just 1 hour by train from London and with easy access to both London Heathrow and Gatwick airports. It is a port city on the beautiful south cost with easy connections to the continent. It is well known for its maritime connections and is home to the National Oceanography Centre, the Southampton Marine and Maritime Institute and Lloyd's Registry Global Technology Centre. Founded in 1878 as the original law department of the University of California, UC Hastings is a law school of national prominence located in San Francisco, which is regarded by many to be one of the most beautiful and progressive cities in the country. Degree programs include a one-year, full-time Masters of Law (LLM) in U.S. Legal Studies and a three-year, full-time Juris Doctor (JD) degree. UC Hastings is renowned for its robust experiential learning opportunities which include the tech-oriented Start-Up Legal Garage, and law clinics such as the Medical-Legal Partnership for Seniors. The law school is adjacent to four courthouses serving every level of the U.S. judicial system including the San Francisco Superior Court, the California Supreme Court, a federal U.S. District court, and the famous federal level 9th Circuit Court of Appeals. American University Washington College of Law is a leading law school at the center of policy, business, and all things international. Here, students receive a legal education that prepares them to tackle a breadth of challenges in Washington, D.C., throughout the country, and around the world. Our programs include the three-year J.D. program, one-year LL.M. programs, an option to enroll in the J.D. program with advanced standing, and online programs. Our LL.M. programs take about one year to complete and give students the experience they need to jumpstart their legal careers. Our first LL.M. program in International Legal Studies was established 35 years ago to train lawyers in international law – we now offer 5 LL.M. programs and have over 3,500 alumni worldwide! Birmingham Law School is in the top 15 of UK law schools and in the top 100 law schools globally. We have around 200 international students from across the globe studying on our LLB and LLM programmes. Birmingham Law School is a research-led law school, with 96% of the research we carry out classed as having global impact. Our staff are academic lawyers who are leaders in the fields, conducting cutting-edge research to contribute to law reform and the policy-making process. We have a wide range of LLM programmes available, including specialist programmes such as our International Commercial Law LLM which are still open for applications to start in 2017. UCLA School of Law has a global reputation for excellence. The law school boasts a dynamic, flexible curriculum that appeals to a broad range of interests, and students pursue specialized studies in a wide variety of disciplines. UCLA Law faculty has an exceptional record of cutting-edge, impactful scholarship, and are among the most influential scholars in the nation. Our students are among the best and brightest in the world, and compose a diverse, close-knit community. Los Angeles is a dynamic, cosmopolitan cultural center boasting arts and entertainment offerings galore, and UCLA is located at the heart of it all. UC Davis School of Law is approved by the American Bar Association. The Juris Doctor program of study is a full-time day program. Combined degrees and LL.M. and Summer International Commercial Law LL.M. degrees are also offered. The University of Auckland Faculty is the highest ranked law school in New Zealand and has the largest postgraduate law programme. Queen Mary University of London is one of the largest colleges in the University of London and one of the few in London with a fully integrated teaching, research and residential campus. Our unique setting gives students the benefit of both large campus environment and access to countless academic and social opportunities in London – one of the great world cities. With around 21,187 studentsand 4,000 staff, we are one of the biggest University of London colleges. Queen Mary is one of only 24 universities making up the prestigious Russell Group, which represents the leading universities in the UK. Queen Mary has made a strategic commitment to the highest quality of research. We have invested in this principle by systematically recruiting the best academics in their disciplines from around the world. Following the most recent Research Assessment Exercise (RAE 2014), ranked us 9th in the UK for the quality of Research and staff to student ratio. Ranked 15th in the UK and 113th in the world by Times Higher Education (2016-17), Queen Mary is now one of 24 leading UK Universities represented by the Russell Group, which is committed to the very best research, and an outstanding teaching and learning experience. QMUL is rated particularly highly for the number of international students on campus. With students and staff from more than 150 countries. Top employers recognise the quality of a University of London degree from Queen Mary, so our graduates stand out from the crowd. Our graduates are consistently in the top 10 for graduate starting salaries in the UK (The Sunday Times University Guide 2016). Ranked among the world's top 16 law schools, the Australian National University is Australia's national law school. With many academic staff recognised as leaders in their fields, the ANU College of Law has an enviable research profile, holding particular expertise in constitutional and administrative law, international law and environmental law. Our capital city location links us with the nation's key law-making and legislative bodies. In theory, there is no gap between the theory and the practice of public international law. In practice, there is. The LL.M. in International Law at the Graduate Institute is specifically designed to bridge this gap. Founded in 1927, the Graduate Institute is Europe's oldest school of international affairs, and has a distinguished tradition in international law. Our LL.M. provides advanced, comprehensive and practical training in international law. LL.M. students gain exposure to world-renowned faculty, benefit from being at the heart of international legal affairs in Geneva and share ideas with other participants from different legal backgrounds and perspectives. UNSW Law is ranked 14th Law School in the world and located in Sydney Australia. UNSW Law is a global leader in legal education, research and public engagement. The excellence of our teaching, research and the outstanding support we provide students at every level ensures we continue to attract the most talented teachers, researchers and students from Australia and internationally. The work of our graduates and academics has a major impact on local and global debates that lead to real change in public policy and the law. Our leading research centres promote academic scholarship, public awareness and work to shape future legislation whilst playing a key role in the education of our students through the provision of internship and clinical legal education. Dating back more than 175 years, Manchester Metropolitan University is one of the largest and most popular universities in the UK. We have over 37,000 undergraduate and postgraduate students, including a diverse community of 3,000 international students from 120 countries. More than £350 million has been invested to create a world-class learning environment with some of the best teaching and learning facilities in the UK. The University is now placed amongst the global top 3% of institutions and is ranked 59th in the UK*. Manchester Met has earned a strong reputation for developing work-ready global graduates, with over 90% of students going straight into employment or further study within six months of graduating. We have over 1,000 courses with a focus on industry experience and employability, links to over 70 professional associations and strong working relationships with global industry leaders. We do have an India Team which was established in 2010, led by Mrs Prachi Hajela Singh and is centrally located in the country's capital city, New Delhi. The office serves as a very important link between the university, its partnered institutions and agent advisors, it also acts as a supporter of direct applicants & Indian Alumni events of promotional activities." The LL.M. Program at the University of Maine School of Law is small and selective to allow us to maintain our commitment to a personalized legal education that few law schools can match. Maine Law affords graduate students the ability to customize their studies to meet their individual needs and interests. Our rigorous curriculum, influential scholarship, and innovative programming prepare students for success in a variety of fields. Our LL.M. students can select from a range of courses in diverse subject areas. Students at Maine Law receive not only robust classroom instruction but also hands-on learning experiences, practical skills, and advising that will prepare them for careers as attorneys, judges, academics, business innovators, and government leaders in fields like information privacy, entertainment, medicine, and the environment. Maine Law also takes its students out into the world to take advantage of the many opportunities outside the classroom to collaborate with other institutions of higher learning, industry, and non-profit organizations to study some of the most cutting edge problems facing society today. From the moment students arrive, Maine Law offers them full academic and community support, including faculty and peer mentors; dedicated library research support; small class sizes, and numerous extracurricular activities to allow them to experience all that Portland, Maine, and American culture have to offer. Maine Law's academic support program provides workshops specifically to help LL.M. students make the most of their studies, as well as access to teaching fellows and individual consulting and one-on-one tutoring when needed. 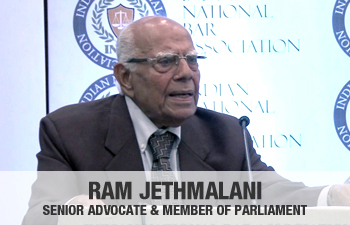 Ram Jethmalani (born 23 September 1923) is a Member of Parliament (Rajya Sabha), Senior Advocate (Supreme Court of India) and an eminent professor of law. He has served as India's Union Law Minister and as Chairman of Bar Council of India. As a lawyer, he has represented a sweep of cases from the high-profile to the controversial for which he has faced both accolades and severe criticism. Ram Jethmalani, known as a maverick lawyer with many distinctions to his credit, obtained a law degree at an early age of 17 and started practising law in Karachi until the partition of India. The partition led him to move to Bombay as a refugee and he began his life afresh with his family. He first married Durga, at the age of eighteen, and later Ratna Shahani, who was herself a lawyer, in the year 1952. He has two sons and two daughters, of whom, Mahesh Jethmalani and Late Rani Jethmalani are also well known lawyers. He was elected a member of parliament in 6th and 7th Lok Sabha on a Bharatiya Janata Party (BJP) ticket from Bombay. He has served as Law Minister of India and also as Minister of Urban Development during the Prime Ministership of Atal Bihari Vajpayee against whom he later contested in General Elections of 2004 from Lucknow constituency. He is a well known face amongst the legal community in India. Even though he is primarily known as only a criminal lawyer, he has appeared in many important cases concerning constitutional matters. On 7 May 2010 he was elected to be the President of Supreme Court Bar Association. He is also the Professor Emeritus of Symbiosis Law School, Pune; and has also served as the Chairman of the weekly newspaper 'The Sunday Guardian'. He has published many books, namely 'Justice Soviet Style', 'Big Egos Small Men', 'Conscience of a Maverick', 'Maverick: Unchanged, Unrepentant'. He has also written books on various law subjects such as Private International Law, Media Law and Conflict of Laws. He also has two biographies written after him, 'Ram Jethmalani: An Authorized Biography' by Nalin Gera; and 'The Rebel' by Susan Adelman.